Before class write each word of the verse on separate index card. To make it harder you can include some words that don't belong in the verse. 1. Tape the index cards to the dry erase board in random order so that the words can be seen by the whole class. Write the Bible verse on the board in large letters with some words missing. Draw lines where the missing words belong. 1. Have your children take turns picking a word from the board and placing it where they think the word might belong. Before class write each word of the verse on two index cards. Make sure that the writing doesn't show through to the other side. Make one set of cards for every four or five students. Place the cards face down on a table in rows. 1. Divide your children up into groups of four or five children. 2. Have them take turns turning over two cards to see if they match. If they match the child who turned over the cards gets to keep them and take another turn. If they don't match the child has to turn them back over, and the next child takes a turn. 3. The player with the most cards at the end of the game wins. Before class write words relating to your Bible lessons on the index cards. 1. Pick one child to start the game. The child picks a card and reads the word or words on the card to himself or herself. 2. The other children take turns asking one yes or no question and then try to guess what the word on the card is. The child who guesses correctly gets to pick the next card. To make the game easier, you can pick categories such as people, places, miracles, actions, etc. and write them on the board before class. When a child asks a question from the categories mark it off on the board so another child won't ask the same question. For example, if a child asks, "Is it a person? ", mark off person on the board. Before class write each word of the verse on an index card. Make sure that the writing doesn't show through to the other side. Make one set of cards for every four or five students. Divide your class into teams, mix up the cards and give each team member at least one card from one set of cards. Each team should receive one whole set to spell out the verse. 1. Children take turns running up to the front of the room, taping their cards in order to spell out the verse. The team that gets all their cards in order first wins. 2. You can play this game two different ways. You can go over the verse before the game starts so that everyone knows the verse, or you can have the teams try to figure out what the verse is by rearranging the cards. Children can only rearrange the cards on their own turn. They may help their teammates by shouting out the order of the cards if they would like. Cut your index cards into different sizes each a little bigger than the other. Write the Bible verse on the cards in order, either from smallest to largest or largest to smallest. Make one set for each child. You can use the same size cards and just number each card in order of the words in the verse. 1. Before class make one set of cards by writing one word of the verse on each card. 2. In class tape all the cards on the board in order. 3. Have your children take turns removing one card and then saying the verse. The child who can say the whole verse without any cards showing wins. 1. Before class write all the words from the Bible verse, or words and word phrases from your lesson on separate index cards. 3. When all the words have been acted out and guessed have your children place the cards in order to spell out the verse. If you are using the words from you lesson, when a child guesses the word ask him ho that word or word phrase relates to the Bible lesson. 1. Before class write all the words from the verse on separate index cards. Make several sets. Mark off a start and finish line with tape. Place a set of cards at the start line of each team. 2. In class place your children into teams and line them up at the start lines. 3. To play the child at the start of the line places a word card on top of his shoe (This is the only time he can touch the card with his hands.) and tries to walk across the floor to the finish line without dropping the card. If the child drops the card, another teammate must pick it up and place it back on the player's shoe. The player may not touch the card with his hands to pick it up. Once the player gets the card to the finish line, he must push it in order with his foot to spell out the verse. The team that gets all the cards in order first wins. Before class hide the books of the Bible written on index cards around the room. (Tape them under chairs and tables, hang them from the ceiling with thread, etc.) On the word "go" have your children look for the cards. When a child finds a card, he or she should bring it to the front of the room and place it in the correct order. Write the books of the Bible you are studying on index cards. Start with three or four books. Turn over the cards and have the children take turns turning them over. They must turn over the cards in order. For example, if you are using Genesis, Exodus, Leviticus, Num. and Deut, they must first find Genesis. If a child finds Genesis, he takes another turn and tries to find Exodus. If he finds Exodus, he can take another turn and tries to find Leviticus. He keeps turning over cards until he gets one out of order. If he doesn't find all the cards in order, he must turn all the cards back over without mixing them up. The other children should be watching carefully so they can remember where the cards are. Keep playing until a child can turn over all the cards in order. You can also make a set of cards for each child. Turn over all the cards, and have the children take turns looking for the cards in order. If a child finds the first card in the series, he gets to keep it. On his next turn. Count how many students you have and write the Bible verse on index cards so that you end up with the same amount of cards as you do children. You may have to put more than one word per card. Mix up the cards and give one to each child. 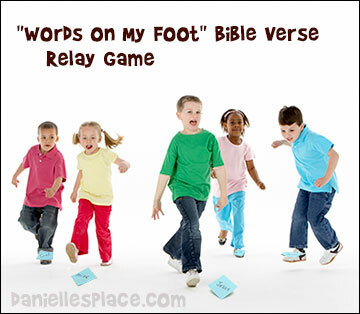 On the word "Go" your students should try to line up in order to spell out the verse and then each child should read the word or words on his card. Time them to see how long it takes them to complete the task. Have them try again with different cards to see if they can beat their first time. New! - Tell your children not to look at their own card, but tape them on their forehead. They have to figure out where they belong in the line without knowing their own word. Children are not allowed to tell each other what their words are. They are only allowed to tell them where they belong. Count how many students you have and write the Bible verse on index cards so that you end up with the same amount of cards as you do children. You may have to put more than one word per card. Mix up the cards and tape one index card on the back of each child. Tell your children that they are not allowed to tell anyone what word is on anyone's back or speak out loud during the game. On the word "go" they must get in order to spell out the verse without talking. They may only use hand signals. Time the players to see how fast they can do it. Change the index cards on the children's backs and play again to see if they can beat their time. Make a set of cards for each children with one word of the verse on each card. Give each player a straw and a set of cards. Have them spread out the cards on the table in front of them so that all the cards are showing. On the word "go" children place the straw in their mouths and try to place all the their cards in order to make the verse without using their hands. The player who puts all the cards in order first wins. Write the words from your Bible verse on index cards, one word per card. (Use only part of the verse for younger children.) Show your children the cards, read each word, and place them in order. Tell your children that you are going to take one of the cards away, and they must try to figure out which one is missing. Mix up the cards, set one aside, and place the rest of cards in random order on the table. See who can tell you which card is missing first. If a child answers wrong he is out of the game. The child who guesses correctly first gets to keep the card. The child with the most cards at the end of the game wins. 1. Before class make sets of the the Bible verse cards printed on index cards, one word per card. Make at least as many sets as you have children. 2. In class have your children sit in a circle. If you have a large class make more than one circle. Place the cards face down in the middle of the circle. 3. The object of game is to be the first person to pick out the cards in order to spell out the verse. 4. 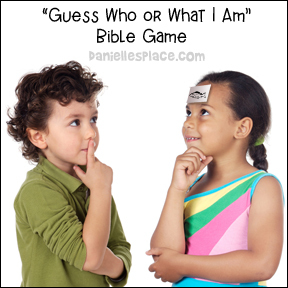 Have your children take turns turning over one card at a time to see if it contains the word which that child needs. The first card should be the first word of the verse. If the first card is not the first word of the verse, the child should turn it back over and let the next child try. Once a child has found the first word, he will try to find the second word of the verse on his next turn, and then look for the third card after he finds the second card. Keep playing until one child has found all the cards in order and has the complete verse. Write a Bible verse on index cards, one word per card. Use only part of the verse for younger children. Show your children the cards, read each word, and place them in order. Tell your children that you are going to take one of the cards away, and they must try to figure out which one is missing. Mix up the cards, set one aside, and place the rest of cards in random order on the table. See who can tell you which card is missing first. Replace the missing card. The child who discovered the missing card first gets to remove a different from the set and then place the cards in front of the other students to see who can find the missing word first. Keep playing until the children know the verse. To make this game easier, write the verse on the board so that your children can compare the words on the board to the words on the index cards. Image cards cut out into individual squares. Tape to stick the cards to the kids foreheads or some larger rubber bands that will easily fit around their heads. 2. Place one of the image cards face out on the kid's foreheads. Everyone else will be able to see the picture, except for the kid wearing the card. 3. The goal of the game is for the kids to figure out what picture is on their forehead. 4. Have the kids go around to each other and ask "yes" and "no" questions to figure out what item is pictured on their card. 5. If you choose, declare the kid who figures out his picture first the winner. 6. Mix up the cards and play again as time allows. Instead of asking yes or no questions, allow the kids to only "act out" what they see on someone's forehead. Choose one kid to be "it" and have them stand in front of everyone. Attach one image to their forehead and let them go one by one through every child in the class, asking "yes" or "no" questions. The child who answers the last question before the image is guessed gets to come to the front of the room and begin a new round of the game. Once the kids have guessed the image on their head, have them keep the card on their forehead. Tell them not to forget what it is! Then, during your lesson, have the kids come up as their image is used in the story and act out what they are.